James Palmer of NFL.com reports that Houston Texans cornerback Kareem Jackson has gotten reps at safety during OTAs. Jackson has played either boundary corner or slot corner for the Texans in all his seven seasons as a pro. In 2016 Jackson played 61% (515) of his coverage snaps over the slot. He ranked as the 35th (out of 111) best cornerback with an overall grade of 77.7. Among cornerbacks that primarily played in the slot, he ranked fifth overall. Jackson has shown at times that he can be one of the best cornerbacks in the league. 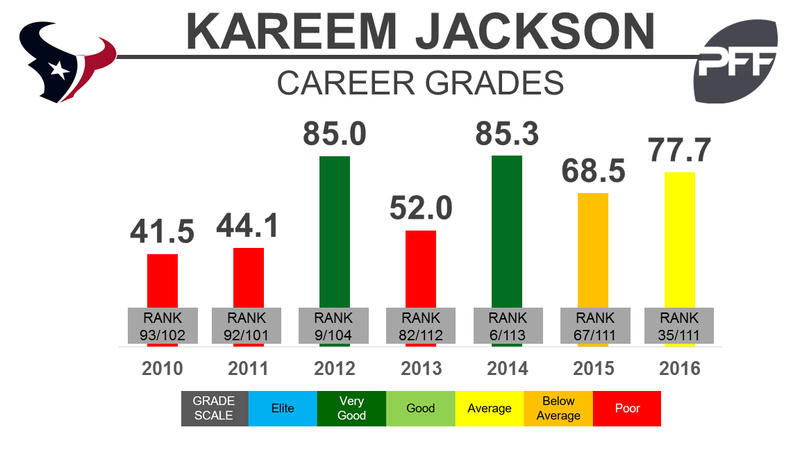 In 2012, he graded as the ninth best corner with an 85.0 overall grade and in 2014 he graded as the sixth best with an 85.3 overall grade. During the Texans playoff game against the Patriots, Jackson played 11 snaps at free safety for the Texans. The only game in 2016 he played more than one snap at the position.